Maybe you weren’t planning on asking for new pans this Christmas… But if your pots and pans look anything like the stuff in the picture above, you might want to reconsider writing a letter to St. Nick. If your kitchen cookery DOES look like the stuff above, don’t fret. There is hope. That is actually a picture of all the stuff that was in my kitchen that I got rid of this year. Now, I am happily cooking with better alternatives, and NO, it isn’t any more work! If you are one of the millions of people still using non-stick pots and pans, did you know that every day you are exposing yourself and your family to hidden toxins? Non-stick cookware is made using a carcinogenic chemical called perfluorooctanoic acid (PFOA) and coated with a synthetic polymer called polytetrafluoroetheylene (PTFE). Every time you heat non-stick pans, they emit toxic gases (PFIB), which are released into the air and you inhale. It only takes five minutes for six toxic gases to be released. These gases are known to kill birds, and people that are more sensitive to them and actually get something called “polymer fume fever,” which produces flu-like symptoms. You may have noticed that non-stick pans also tend to wear out over time, resulting in flaking and chipping in the surface of the coating. While the non-stick surface is supposedly “safe” to ingest when it’s not heated (not sure if I believe that…), it does pose a problem with exposing the aluminum underneath. Aluminum, it seems, is everywhere. It lurks in cookware and baking foil, antiperspirant deodorants, vaccines, antacids, toothpastes, astringents, lotions, soda and beer cans, baby powder, self-rising flour, boxed cake and muffin mixes, lipsticks, table salt, and baking powder, to name a few. My first year in college, my roommate bought the Walmart-brand Mainstays aluminum cookware because it was cheap. On day one, the skillet was used to cook a steak on medium heat. But what ended up happening was (1) the kitchen filled with smoke (i.e. toxic gas! ), (2) the steak was ruined, and (3) when the pan was lifted off the stove, there was a hole burned clean through the bottom. I’ve never seen anything like it. It was nuts. While aluminum is found in the earth’s crust and thus could be considered “natural,” it can do long-term damage in your body and your brain. The fact is that your living cells have absolutely NO USE for aluminum. For YEARS, almost TWO DECADES, I suffered from what we thought was eczema. At first it started under my eyes and moved to the insides of my elbows and knees. Within the past 5-6 years, it has been concentrated mainly on my feet and occasionally on my hands. It manifested as tiny, painful, and itchy blisters that made walking almost unbearable at times. My feet would overheat and turn bright red from the rash. I was embarrassed to expose my ugly feet by wearing sandals. But closed-toed shoes, along with any type of heat, just aggravated the rash further. For years, I’ve taken luke-warm or cold showers. In high school, I tried to get rid of eczema naturally by selectively eliminating things from my diet. One at a time, I stopped eating grains, sugar, dairy, etc. But nothing seemed to help. It was only this year in August, that we discovered I was actually reacting to aluminum! We immediately got rid of anything in our house containing aluminum—(Did you see that I also JUNKED OUR BATHROOM? )—and within a WEEK, my skin had cleared up. I haven’t touched anything that could even POSSIBLY be aluminum since, and my skin hasn’t broken out again. It feels like a total miracle. Back to cooking. So what do I use now? Simply put: cast iron, stainless steel, and glassware. I love my cast iron pans because they heat evenly, and they work efficiently on very low heats. Even when frying things, I never have to go above medium heat on the stove. Clean-up is a breeze. It took me about a week to “break-in” my pans, but after using them a few times, now not even eggs stick! I use my large and medium skillets so much that they never even leave my stove top. And here’s a nifty trick for you: if something does stick to the bottom of the pan, simply cover the bottom with water and boil it for 5 minutes. Whatever is stuck should lift right off! But always make sure you dry your pans after washing and avoid washing with soap, as it can mess up the seasoning. The biggest thing I miss is probably my cake pans. As you can see in the first picture, there are two round cake pans sitting in that junk pile. When I junked my kitchen, the non-stick pans had to go. (They didn’t work anyway, as I always had to line it with parchment paper!) I don’t want to spend the $20 to go buy glass ones yet, and I made a cake yesterday in my 9″x13″ glass casserole pan that tasted just the same anyway. ; ) Frank didn’t complain. I’ve also had to learn to find alternatives for aluminum foil. For baking, I’ve used banana leaves and glass lids. For storage, I simply use a tupperware or plastic wrap. Yep. It’s going to cost a little bit. But you’ll quickly find you can be creative! Look on Craigslist for used cookware. Frank and I found our large red cast iron skillet on there for $10! TEN BUCKS! That’s fantastic, and all the more reason to love it. Every time I cook with it, I feel like I won something because it was such a great deal. It also has deeper sides than your typical skillet. Just another reason it stole my heart. We also junked our rice cooker, and when we did, we felt totally ridiculous! Now, we cook rice in a stainless steel pan on the stove, and guess what. IT DOESN’T STICK. Remind me why we used a non-stick rice cooker again? The bread pans also had to go. 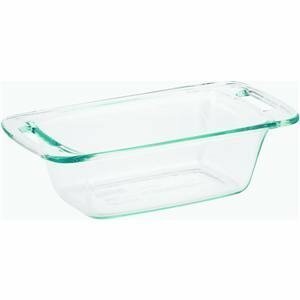 But lucky me, my local grocery store sells Pyrex glass loaf pans for $5 a piece, AND they last pretty much forever (unlike non-stick stuff). As for the non-stick part? Simply grease up the sides with butter, and they work BETTER than any chemical coating! Not to mention, my bread tastes better (from the butter!). As for the baking sheets, they have stainless steel and stoneware baking sheets, both of which you could line with parchment paper or buy a Silpat mat to prevent sticking. and be a healthier, stronger YOU! Featured on Party Wave Wednesday and Allergy Free Wednesday. What’s the trick to getting things NOT to stick on SS pans? We’ve used coconut oil & grapeseed oil (not currently using butter because of dairy allergies but when we did it still stuck – even using a lot). Suggestions on a better mixer? The hand mixer we have is great …but the mixers are rusting!? I don’t know why they make kitchen stuff like that! I have found that if I add a minute amount of liquid lecithin to my oil, food doesn’t stick to my SS pans. I use sunflower lecithin purchased from Azure Standard. I am wondering about all of my Farberware stainless steel pans. I bought this set a while back… http://www.wayfair.com/Farberware-Classic-Stainless-Steel-10-Piece-Cookware-Set-71237-FBR1148.html I already got rid of both of my skillets/fry pans from this set because they were nonstick and aluminum, but they all have an aluminum core…is that bad as well? Also, I was wondering about my silicone baking pans and cupcake liners, are these bad or good for us? I just love these “junk it” challenges. It’s such a good reminder to keep my eyes open for areas of improvement. Thank you! So….the porcelain enamel on the cast iron is OK? Nontoxic? Also…what about the supposed greenware pans that aren’t manufactured with the above chemicals mentioned that are typically a part of nonstick cookware? Porcelain enamel on the cast iron = ok. I looked them up, and people are saying they have a short lifespan and will need to be replaced after a couple years. Even if I knew 100% without a doubt that they were safe, I wouldn’t spend the money on them just to have to replace them a couple years down the road. My Le Creuset was a little bit more pricey upfront, but I anticipate it lasting me a few decades, at least. Thank you for the quick response Courtney! What do you recommend for pancakes? I use this bad boy in the 12″ size, with lots of butter. You can see it in use HERE (in my pancake recipe). Last year we bought the Rachael ray brand of hard anodized steel cookware… I don’t suppose this is any better than the other stuff? though they said it was, of course. I do also have glass and cast iron. The Rachael Ray pans that you have are hard anodized aluminum with non-stick finish, unfortunately. Those are the same type of pans I got rid of. :/ They tricked me, too! We got two skillets like this as wedding gifts and didn’t think anything of it at the time. They are the two bottom skillets in that stack of three in the picture. If you really want to know how healthy YOUR COOKWARE IS THEN BOIL one table spoon of baking-soda in your pots if it tastes like baking soda after 5min of boiling vigorously your cookware is OK, if it tastes awful (which it will) it is poisoning you. Make sure you do the same test on Pyrex. Any questions contact me. Is there any way to tell that my stainless steel does, or does not have aluminum? Do you know what brand it is? I would try to Google it if you’re not sure. Stainless steel is also heavier than aluminum and usually looks more polished and less gray. I would still Google it. Yes, I love this too! I just discovered that one of our pots was aluminum-clad stainless steel, so into the trash it went. I’m going to be combing carefully through the rest of our cookware/bakeware today. That’s what happened to us! When we got married, we received a large skillet that said “STAINLESS STEEL” bright and bold on the front. We didn’t realize there was aluminum in there, too, until this year! Tricky tricky. We won’t be fooled again, though. No way I’d risk it!